In 1953, six Hinsdale women were appalled at the condition of the local dog pound. The unheated “shack” had no hot water and one light dangling from the ceiling. The local newspaper reported “A committee, armed with pick axes and disinfectants, has cheerfully braved soaring temperatures and disconcerting filth in order to improve the condition of the existing municipal building pound, on the theory that nobody would want a pet impounded for ‘even an hour’ in the enclosure as it stood at the time.” A rabies outbreak was on everyone’s mind that summer of 1953. The women began the Hinsdale Humane Society as a not-for-profit organization and established three initial goals. The first was to educate the public in the proper training and handling of animals. The second was to arrange for humane disposal of unclaimed and unwanted animals. The third was to provide a safe and sanitary pound which would eventually replace the unsatisfactory facilities. Jim Healy, son of Virginia Healy, remembers those early days. “I was a junior in high school and I’d come to the shelter every day at 5:00 p.m. What was important was taking care of the animals.” The beginning years were difficult. The shelter was plagued by lack of room and lack of funds. The ladies paid for most of the supplies themselves. Jim remembers his mother using her own 1951 Cadillac Deville to pick up strays. Because there was no phone, the ladies answered calls from their home telephones. The dedication of the volunteers was paramount to the success of the organization in our early history. In many ways, the core values of the organization have remained unchanged today. However, a big change was becoming a reality. “A dog’s life will be a better one in Hinsdale after this fall,” read the lead article in the July 1958 Hinsdale Doings. 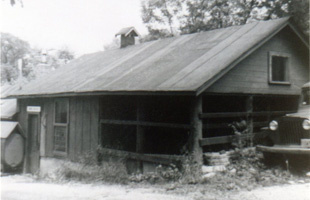 The Village Board had just given the green light to the Hinsdale Humane Society’s plan for a new “dog pound.” The building on its present site was dedicated on September 17, 1959 at a cost of $25,000. The new shelter had 11 kennels, a small room for dogs and cats, and a reception area. It was the first Humane Society in DuPage county. As part of Humane Education, “The Perils of Pal” brochure was developed in 1956. Pony Chambers, one of the original founders, was believed to be the commercial artist. The brochure was in such demand that the ladies copyrighted the contents and shared it with other humane groups. Wanting to reach out into the community and help others, Hinsdale Humane Society began its Pet Therapy program. Our work began with Pet-a-Pet which took therapy dogs into nursing homes in 1982, and in 2005 we added the READ (Reading Education Assistance Dogs) program. In 2010 therapy dogs began working with children with special needs at Adventist Paulson Pediatric Rehabilitation Center. And in 2013 HHS started a relationship with Behavioral Evaluation Unit at Adventist Hinsdale Hospital. Our goal is to work with patients who suffer from anxiety and depression. From those humble beginnings, HHS is still operating at the same location. The building doubled in size in 1974. 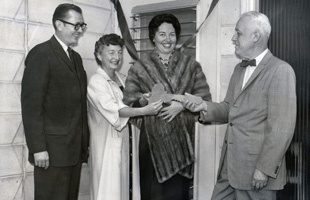 Remodeling and expansion occurred again in 1983 for the Society’s 30th birthday, adding a kitchen and medical treatment room. The shelter received its most recent update in 1994, thanks to a major bequest from the estate of Charles Hillinger. The surprise gift was even featured on the Oprah Winfrey Show in a segment regarding unexpected kindness. Of course, the Society’s primary purpose was to place as many animals as possible, mostly canines and felines. But throughout the years, other exotic creatures spent time at HHS. In the late 60’s, a peacock was brought in as a stray, before it could be reunited with its owners in Oak Brook. And in the 80’s a 3 foot long pet snake resided here for weeks. We can honestly say that some staff members were less than thrilled with this stray animal! The Haitian Boa was eventually claimed. The owners didn’t realize it was missing and thought it was hiding in their home. As we celebrate 60 years and reflect on the past, we also look forward to the future and the millions of lives we’ll continue to touch – both two and four-legged ones. In 2012 we adopted more than 800 animals out to loving families, and our programs continue to grow in the schools, hospitals and more. We’re honored to serve this community, and blessed to have the amazing group of more than 300 volunteers who keep HHS thriving.